The most overlooked aspect of guitar playing has always, and will always, be rhythm playing, yet it is the element that most of us will spend the majority of our time doing. Funk is a genre that never really goes out of style, especially currently with bands like Daft Punk employing the likes of Nile Rodgers to add that groove to their major commercial hits. With funk playing, the most important aspect is that you keep your strumming hand moving consistently. The 1/16th notes that make up the backbone of a lot of funk require strict alternate strums. Always start with a downstroke and then alternate with an up stroke (counting 1e+a 2e+a 3e+a 4e+a). This will keep you in time and sync your right hand and left hands. 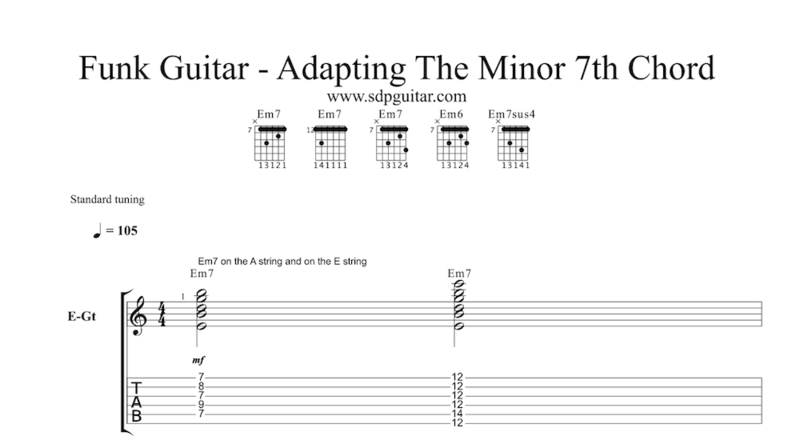 Today we are going to look at how to spice up a minor 7th chord. If you are unfamiliar with this chord shape, check out the chord diagram and tab below. So without further ado lets look at the adaptions you can make to add a new flavour to this chord. Try these adaptations on any other chord shapes and you will quickly break out of those rhythm-playing ruts. Although we already have the b7 note needed to make this chord a minor 7th, doubling it up gives us an incredibly funky sound. Add that into your normal Em7 type progression and instant funkiness awaits. The example included demonstrates this. Funk Guitar Example 2: Adding in the 6/13. Now that you’ve got number one down. Try moving your little finger back to the 9th fret of the top E string. This gives you the 6th. Creating a very Prince type sound. Adding in the 10th fret of the second string adds the 4th into the chord. Suspended chords are brilliant as you can use them instead of both major and minor chords, as you have replaced the 3rd with a 4th. Try resolving this chord shape to E major as well as the shown Em7. This one is not so easy to master. 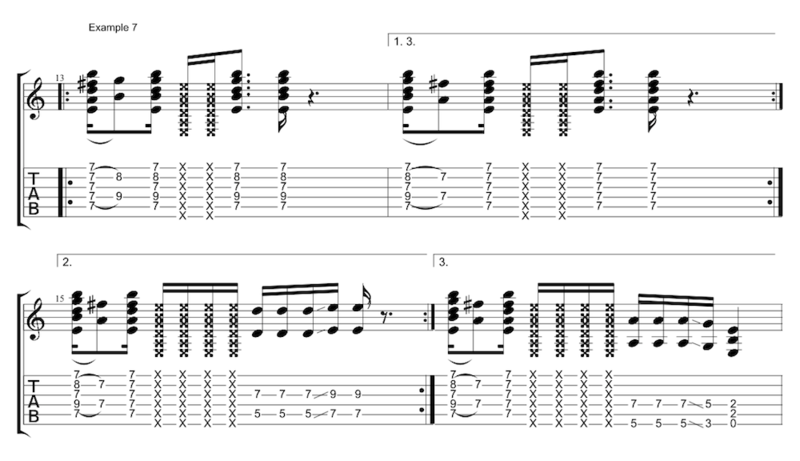 Try sliding the whole chord in from one fret below. Push in hard with your barre chord. Play around with sliding in from above too (although below is usually better). Try this one on all your chord shapes, once you master this will be a fantastic addition to all your rhythm playing. A great technique booster is being able to hammer / pull off individual fingers whilst still holding down the full chord. In this example we hammer / pull off the middle finger. Funk Guitar Example 6: Hammer on / pull off with the ring finger. Same as example 5 but with the ring finger. The ring and little finger are notoriously more difficult to maneuver than the index and middle counterpoints. Take some time over this example. Funk Guitar Example 7: The two finger hammer on / pull off. Once you have mastered individual finger hammers and pulls, it’s time to try using both at once. This can be tricky at first Make sure to keep your barre pushed it and really work on the accuracy. Remember speed is a bi-product of accuracy. Get it right before you try and speed it up. Think Doobie Brothers – Long Train Runnin’. Funk Guitar Example 8: Putting it all together. For the final example I have put some of the above into a mini etude. This shows you that you may only have one chord to play but it never needs to be boring. Try these techniques out in your own style of rhythm playing! As fun as it is to combine everything at once, generally regard these as a pallet to draw from. You can create fun and interesting combinations with them but try not to overdo it. Virtually anything with Nile Rogers on guitar is a great place to start. Check out the best of albums of Chic and Sister Sledge. As mentioned above these types of examples can be heard on the recent Daft Punk album “Random Access Memories”.